Optimized to read the english PC & Mac versions. Supports original Mac version as well as the english PC version. Localized versions like this german one are not supported. 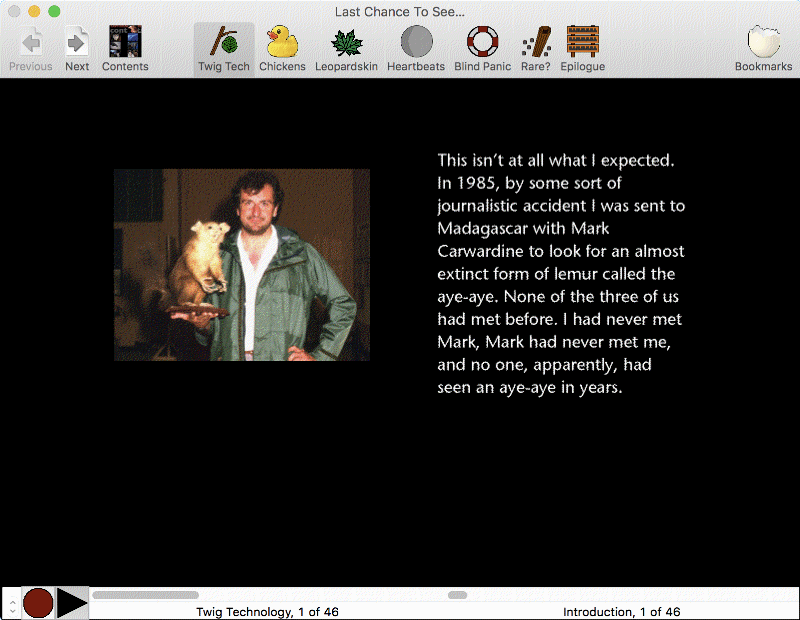 This is a Reader application supporting the 1992 PC & Mac software "Last Chance To See...", published by Voyager. If you're running current macOS versions, this Reader simply replaces the original application available on these CD-ROMs. If you're browsing the PC version, parts of the audio files shipped with the original CD-ROM needs to be played in "Last Chance To See"'s background by VLC. This can be set in the Preferences of this "Last Chance To See" Reader application. More informations about this issue can be found in the "Converting audio files" help file included in the Download. "Last Chance To See" Reader may be included at any download sites, with no permission required.